You might be wondering who Menard is. He doesn’t have the name recognition of a Frederick Douglass or Barack Obama, or even of a Hiram Revels (first African American to serve in Congress) or Blanche K. Bruce (first African American elected to a full Senate term). He holds an important first of his own, though: he became the first African American to deliver a speech to the House from the chamber floor. Menard had won a special election to fill a vacant New Orleans House seat in October 1868. His opponent, Caleb Hunt, challenged the election despite Menard’s 65 percent share of the vote. 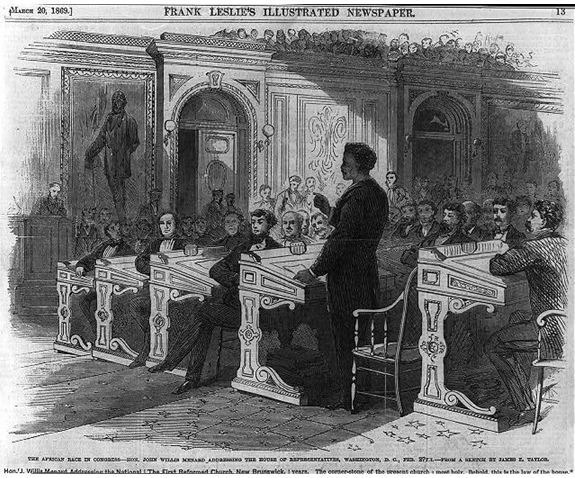 The House Committee on Elections refused to seat either man, but as the debate moved to the full House on Feb. 27, 1869, the rules were suspended to allow each man to make his case for the seat. Hunt chose not to speak, but Menard addressed the House from a desk on the Republican side of the chamber. “Hon. John Willis Menard addressing the House of Representatives, Washington, D.C., Feb. 27th.” Frank Leslie's Illustrated Newspaper. vol. 28, no. 703 (1869 Mar. 20), p. 13. After additional debate by the House, neither man had enough support in the House to be seated. The motion in Hunt’s favor was defeated when 41 voted for it and 137 against. Menard fared better, with 57 yeas and 130 nays, but not well enough. With the 40th Congress ending just a few days later, on March 4, the House chose not to seat anyone to represent Louisiana’s second district. All this is interesting enough, but it doesn’t touch on Menard’s time as an abolitionist newspaper editor, Department of the Interior clerk, or work in British colonies investigating options for resettling freed American slaves or supporting the rights of the resident black populations. If you want to know more about Menard’s involvement in the Jamaican uprising of 1865, join us for Magness’ talk at noon!